I haven’t picked a specific number just yet, but he was pretty young! Only 20 or 21. Bowman was just a wee sprout at the time. By that point, he would have only been a knight for a couple years. Scar showed a lot of dedication and skill in his training, and he quickly earned his spot among the ranks. He was always determined to fight to protect the other wood sprites of Wellwood; indeed, his temperament is exceedingly rare among a pacifist people. Wolves aren’t super common in Wellwood, at least not year-round, but just one can be a serious problem if it wanders too close. This is the case in Scar’s fabled story. A wolf, separate from a pack, had intruded well into the region of the woods that the sprites called home. One patrolsprite was killed and another injured badly. The knights prepared themselves to take the fight to one of the largest enemies they’d have to deal with. They were well aware that some of them might not make it back, but if they could do just enough damage to drive the wolf away, they’d have succeeded. Cerul fretted a lot for Scar, but he knew there would have been no convincing them not to go. He simply promised that he’d be waiting to offer healing to them all when they returned. Despite the odds and the wolf’s viciousness, Scar managed to find an opening during the fight and landed right on its snout. Before it could rear back to snap him up, he put his sword through both of its eyes. Driving it away was easy after that. He earned his name that day, and years later when it came time for a new High Knight, he was the obvious choice. Scar is actually his birth name! He has a very prominent birthmark that extends all the way from his leg up to his back, and his parents couldn’t get the name out of their heads after seeing that. 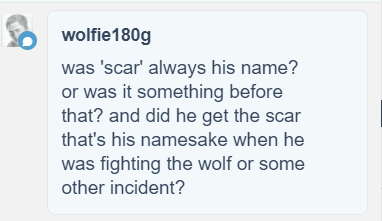 Scar’s name originally came about to me as a writer as part of a theme with two other characters. Cerul, Scar, and a third (not as well known) sprite character of mine Cadmi. I think @creatorofuniverses and maybe @nightmares06 are the only ones to have picked up on the pattern for their names before, but the pattern suits each character’s personality and role in my canon story.